U-profile made of stainless steel 2-fold edged, surface selectable on one side with ground grain 320 or III D mirror surface. You can enter your desired length up to a maximum of the order length mm in the field below. Manufactured from high-quality stainless steel [1.4301] The visible surface is foiled and will only be removed by you during assembly. Protect your wall edges in the office, catering, bakery, schools, clinics or even public buildings. Simply a visually clean and durable solution. For fixing we recommend silicone or assembly adhesive, which you can also order from us. Attention: with 1,0mm sheet thickness the additional edgebands as a facet are to be seen more clearly than with 1,5 or 2 mm. 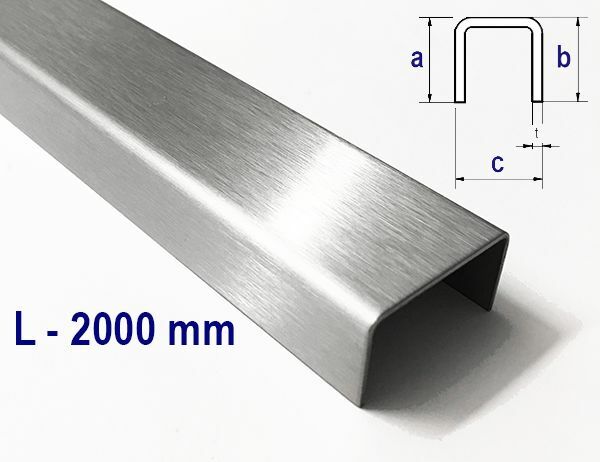 This is due to the resulting radius through the material thickness. Also larger quantities are available, please inquire with us. We will gladly prepare your individual offer. 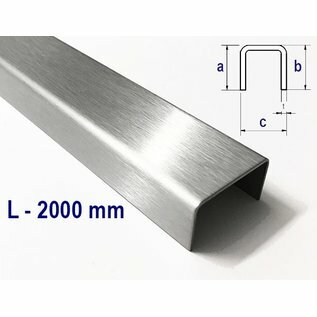 Do you need special bends or other geometries? Just browse through our other categories. The cut edges can still have a slight burr in exceptional cases. All dimensions are, unless explicitly stated otherwise, external dimensions!